Heat & Cool Efficiently - Keystone HVAC, Inc.
As much as half of the energy used in your home goes to heating and cooling. So making smart decisions about your home’s heating, ventilating, and air conditioning (HVAC) system can have a big effect on your utility bills — and your comfort. Take these steps to increase the efficiency of your heating and cooling system. 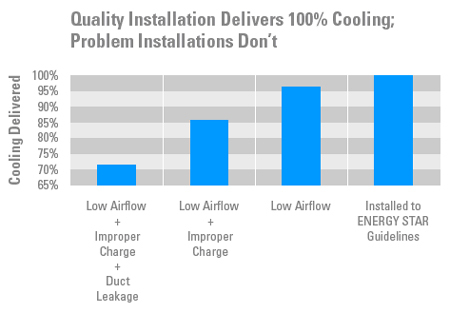 For more information, see our Guide to Energy Efficient Heating & Cooling (708KB). Replacing your old heating and cooling equipment with new, energy-efficient models is a great start. But to make sure that you get the best performance, the new equipment must be properly installed. In fact, improper installation can reduce system efficiency by up to 30 percent — costing you more on your utility bills and possibly shortening the equipment’s life. Installing the right size equipment for the home is essential to getting the best performance and comfort. Many homeowners believe that bigger is better when buying new heating and cooling equipment. But in reality, a system that’s too large will not keep your home comfortable because of frequent ‘on/off’ cycling. Incorrect sizing can also put stress on system components and shorten the equipment’s life. To ensure proper sizing your contractor should provide a copy of the home’s heat gain/loss calculations for your records. To ensure that ducts are properly sealed your contractor should test the leakage rate. If the ducts are very leaky (i.e. more than 20% of the air moving through the system is leaking into spaces you do not want heated or cooled) your contractor should use duct sealant (mastic), a metal-backed (foil) tape or an aerosol sealant to seal the seams and connections of ducts. After the ducts are sealed ask your contractor to wrap them in insulation. A properly charged system will operate more efficiently and help prolong the life of the heating and cooling system. To ensure the system has the correct amount of refrigerant a contractor must test and confirm that the system is properly charged. If the system is not properly charged the contractor should make the appropriate adjustment by adding or removing refrigerant. If air flow in your heating and cooling system is too high or too low, you may confront problems and higher utility bills. A contractor should test air flow and make any needed adjustments for optimal performance. Use the ENERGY STAR quality installation checklist (350KB) when soliciting bids from contractors to help ensure that your system is properly installed.